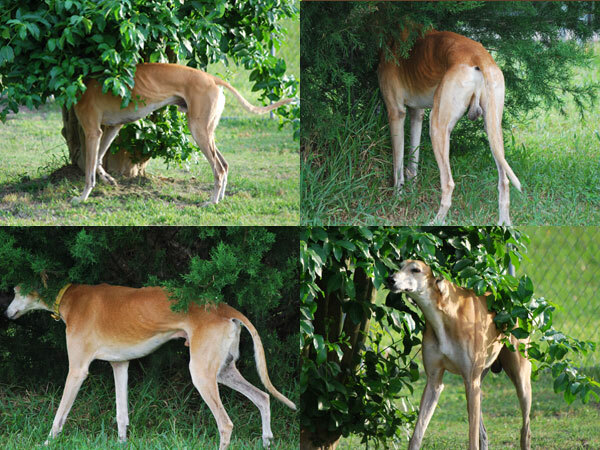 Some Greyhounds are known to engage in what is referred to as “trancing”. They will move back and forth very slowly under a tree branch or a bush — or even a tablecloth or hanging clothes in a closet — that touches and rubs across their back. They appear to be in a trance and are often unable to be distracted by a squeaky toy or someone calling them. This is not any kind of a seizure and is not associated with any known neurological disorders. In fact, it is quite normal, especially in Greyhounds and Bull Terriers. Whatever the cause, the dog seems to find the activity quite relaxing and immensely enjoyable, perhaps much like the human response to a massage.